Queen Jennah’s jubilee celebration continues in Divinity’s Reach. The Queen is preparing to address her subjects and the dignitaries from other cities – but someone else has plans for the Queen’s speech! The nefarious villain, Scarlet Briar, has made herself known to Tyria! Chaos ensues as she unleashes her clockwork minions across the world! Witness the high point of the Queen’s Jubilee! Attend the ceremony and hear the Queen’s Speech in the Crown Pavilion of Divinity’s Reach. It’s sure to end with a bang. Scarlet’s clockwork minions are invading entire zones across Tyria. Watch the World Event UI for new invasions. All overflow maps created within 10 minutes of the start of the invasion will host a concurrent version of that hour’s event. Complete additional waves of the invasion for an increasingly lucrative map-wide reward. Map-wide rewards are limited to once per account, per day, per map. For example, players who claim the map-wide reward for an invasion in the Gendarran Fields will only be able to claim invasion rewards in other maps until the following day. Complete all waves of an invasion to unlock a bonus battle with Scarlet. Defeat Scarlet for a daily world-boss reward of two guaranteed rare items. All possible maps will be invaded at least once per day. Invasions will not occur in Orr, Southsun Cove, or maps suited for character levels below 25. After the Clockwork Chaos release, the invasions will continue at a less frequent pace. Scarlet has claimed and occupied a prominent structure in Tyria and twisted it into a demented fun house. Help Emissary Vorpp at the Crown Pavilion reverse-engineer Scarlet’s portal technology to find a way into her fun house. Defeat Scarlet to restore the fun house to its proper form. The Crown Pavilion and Queen’s Gauntlet will close for maintenance on September 3. Look for their return in the future! Clockwork Chaos contains all release-related achievements and the meta-achievement for this release. Emissary Vorpp’s field assistant contains achievements related to the Living World story for this release. It serves as a guide to completing key achievements in the Clockwork Chaos category. Completing the Clockwork Chaos meta-achievement awards the player an Infinite Watchknight Tonic. Completing this meta-achievement requires players to complete 18 achievements from either the Clockwork Chaos category or the dailies related to the Clockwork Chaos release. 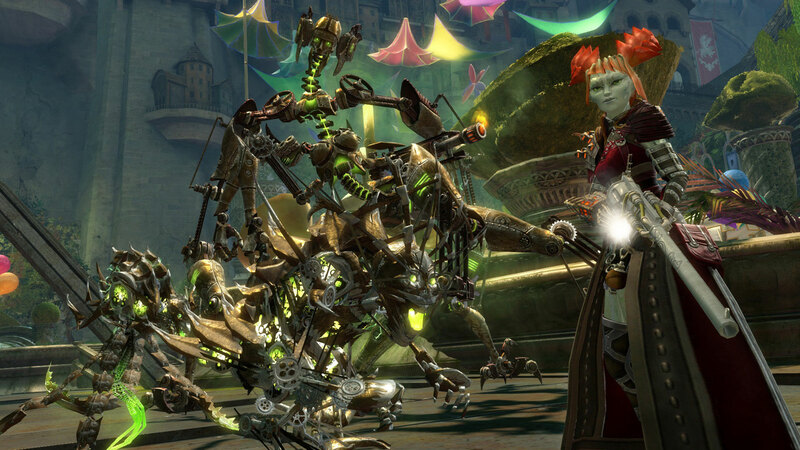 Play Clockwork Chaos content for a chance at the exotic Twisted Watchwork Portal Device Recipe. The recipe requires a level 400 artificer. The ingredients are 50 Watchwork Sprockets, 50 Bowls of Salsa, 1 Unidentified Dye, and 1 Glob of Dark Matter. The Twisted Watchwork Portal Device is a single-use consumable that teleports the user to a random place in Tyria. The destination may be very rewarding, very dangerous, both, or anywhere in between. Trebuchet Mastery has been added to the Ranks and Abilities tab. Increased the damage of trebuchet skills. Disease Cloud from cow ammo now drains supply from enemy players. Increased the radius of trebuchet skills. New skill: Healing Oasis—Fires a shot that heals allies and creates a water combo field. Basic shots that hit enemy supply depots will now destroy some of the objective’s supply. WvW Ability Points are now equal to the earned WvW rank of each character. All rank 1 characters will have 1 World Ability Point. Liquid World Experience is now available as a drop in WvW rank-up chests. When consumed, characters receive a set amount of WXP. Server-side culling has been removed from all PvE maps. More information on culling may be found in this blog post. The character-select screen now displays information about several achievement categories in addition to unlocked account medals. The watch list in the Achievements panel now supports drag-and-drop functionality to organize achievements. Additional visual and audio polish has been added to the achievements system. The amount of karma granted from consumable karma items has been increased. Karma boosts no longer affect the amount of karma gained from consumable items. The minimap and objective list no longer disappear when a character is downed or defeated. “Last of the Giant-Kings” – Korag is now flagged as a veteran to match his difficulty. Signet of Restoration: The signet effect will now play at the start of the cast for this skill. Glyph of Elementals: Removed an unnecessary range fact. Flame Turret—Overcharge: The skill fact now displays the correct radius. Elixir Gun—Elixir F: Added a bouncing skill fact to the base skill when it is traited with Rifled Barrels. Thump: Updated the damage skill fact to more accurately reflect the damage done. Jump Shot: Fixed a bug that caused the vulnerability applied by this skill to be unblockable. Purifying Ribbon: Added a skill fact for the number of bounces. Signet of Wrath: Added a damage skill fact. Faithful Strike: Updated the healing fact to display the correct value. Added a radius skill fact. Bane Signet: Added a passive skill fact and changed the knockdown fact to display the correct duration when this skill is traited with Perfect Inscriptions. Signet of Judgment: Added a passive skill fact that is also updated when traited with Perfect Inscriptions. Signet of Mercy: Added a passive skill fact that is also updated when traited with Perfect Inscriptions. Signet of Wrath: Added a passive skill fact that is also updated when traited with Perfect Inscriptions. Virtue of Resolve: Updated the buff skill fact to accurately display the healing per tick. Hammer of Wisdom: Updated the damage facts for this skill as well as its Command skill. Sword of Justice—Command: Fixed an issue that caused the Command skill to go on full recharge without activating properly when used without a target. Power Cleanse: Removed the range fact as it was unnecessary. Mind Spike: Fixed a bug where this skill was checking for a boon on the mesmer instead of on the target. The extra damage will now be correctly applied when the player’s target has no active boons. Moa Morph/Tuna Morph: Fixed a bug that caused this skill to appear unselectable while underwater. All Phantasms: The ghostly effect on phantasms should no longer fail to show up in low graphics settings. The Prestige: Fixed an issue that caused the blast finisher to occur at the point where the skill is cast, rather than on the mesmer. Putrid Explosion: Added an unblockable skill fact to indicate the skill’s functionality. Bone Fiend: Updated the range skill fact to indicate the creature’s actual range. Lich Form: Updated the skill fact description so that it doesn’t indicate it removes spectral forms. Plague Form: Updated the skill fact description so that it doesn’t indicate it removes spectral forms. Chill of Death: Changed the radius skill fact to a range skill fact. Swoop: The charge portion of this skill no longer spams “miss” while running toward an enemy. Juvenile Lynx—Rending Pounce: Updated the bleed skill fact to display the proper amount of bleeds. Frost Spirit: Added a radius skill fact. Cold Snap: Added a radius skill fact. Sun Spirit: Added a radius skill fact. Solar Flare: Added a radius skill fact. Stone Spirit: Added a radius skill fact. Quicksand: Added a radius skill fact. Storm Spirit: Added a radius skill fact. Call Lightning: Added a damage skill fact and a radius skill fact. Crippling Talon: The projectile thrown will now travel the full distance when traited with Off-Hand Training. Infiltrator’s Signet: Updated the signet’s effect to properly follow the thief when activated. Flanking Strike: Removed a redundant damage fact. Seismic Leap: Fixed a bug so that this skill will now properly be a blast combo finisher. Rampage—Dash: Fixed a bug that allowed the character to move further than intended. Whirling Axe: Updated the skill fact to include a radius. Banner of Discipline, Banner of Strength, Banner of Defense, and Battle Standard: Updated these skills to properly display their duration. Battle Standard now displays the casting range of the skill. Banner—Sprint: This skill will now properly strike a target when it reaches the target while underwater. Kill Shot: Fixed a bug so that this skill will no longer drain the energy of a target that reflects it. Pain Inverter: Replaced the range skill fact with a radius one to more accurately reflect the skill’s function. Minimap is now always centered and cannot be panned or zoomed. Secondary objective icons for tournament maps have been repainted for clarity. Map art for tournament maps have been repainted for clarity. Downed icons no longer overlap profession icons. Spectate camera icons no longer steal mouse focus from capture point icons when not visible. Profession icons are now a fixed size regardless of map zoom level. Player icons now show names in their tooltip. Removed the capture point text from the map. All capture point icons now properly show their name in the tooltip. The Outnumbered buff now provides a 25% boost to all WXP gained. WXP rates have been increased across the board. All activities that award WXP should now reward much more. The Siege Decay buff is no longer visible to hostile players. The Zodiac Weapon Skins are now available for purchase from the Black Lion Weapon Specialist. This weapon skin set is inspired by the classic Guild Wars Zodiac weapons. For one month only, until September 16, these weapon skins cost only 1 Black Lion Claim Ticket. Claim Ticket Scraps can be acquired by opening Black Lion Chests. Black Lion Chest Keys are available in the Gem Store in the Consumable category for 125 gems each or a pack of 5 for 450 gems. Mini 3-Pack Set 2 is now available in the Gem Store in the Minis category for 300 gems. Open this pack to get three random minis from an entirely new set of miniatures! Each pack contains two common and one uncommon mini from set 2. Collect all 46 new minis! The Mini 3-Pack Set 1 is also still available for anyone looking to complete their set 1 collection. The Permanent Twisted Watchwork Finisher is now available in the Gem Store in the Upgrades category for 800 gems. This upgrade gives players unlimited, account-wide access to this twisted finisher. The World vs. World Experience Booster is now available in the Gem Store in the Booster category for 150 gems. This consumable grants 50% more WvW experience for one hour. Mechanical Chaos Meta performance guide! Patch Notes for December 3rd, 2012. Tagged Chaos, Character Levels, Clockwork, Closing Ceremony, Concurrent Version, Dignitaries, Divinity, Emissary, Fun House, Funhouse, Gauntlet, High Point, Invasions, Jennah, Jubilee Celebration, Minions, Notes, Orr, Portal Technology, Release, Reverse Engineer, Scarlet, Villain, Watch The World. « Check Out This Week’s New Gem Store Items!